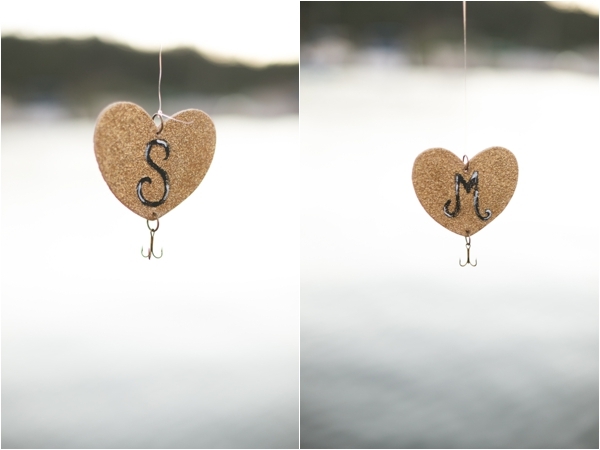 I simple adore Kristen Booth and am always so excited when she shares her beautiful work with me. 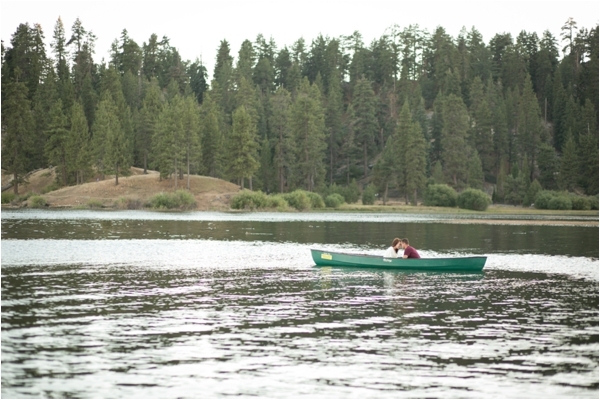 This sweet engagement session took place in Big Bear and I was so excited to see that the couple actually went out into the water on a canoe! Thanks for sharing, Kristen! Their love story: Mark and I met in college. We had an english class together, but at the time I had a boyfriend. Mark claims he had an instant crush on me, but didn't show it. He was always nice to me (never flirty) and we would txt every now and then just as friends and see how each other was doing. My boyfriend and I broke up. After about a year Mark and I hadn't talked much, but my sister was out christmas shopping(2009) and Mark asked her "are you sierra's sister? 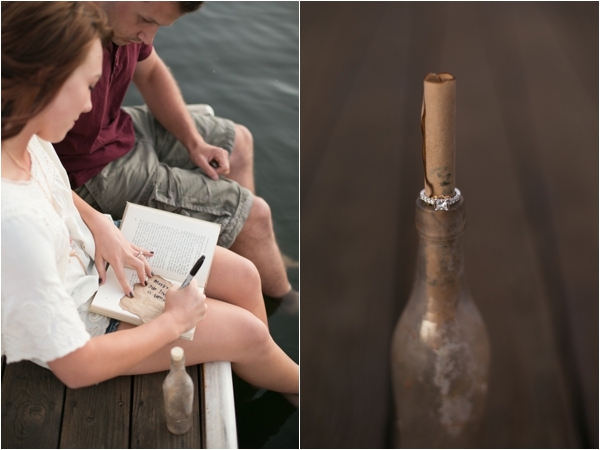 She said yes, really confused as to why someone she'd never known was talking to her. Well she called me and told me "Mark Tucker" says hi and I texted him that night. From then on we txted constantly. He asked me to be his girlfriend a few months later on valentines day and since then we've had our ups and downs, but through it all we knew we wanted to be with each other always. He was the country boy I always wanted to be with and he says that from the first time he saw me smile he told all of his friends that he would be with me one day. Mark is currently a deputy sheriff and I am in nursing school to become an RN. The proposal: Mark and I LOVE Disneyland. He surprised me and bought us annual passes for our 2 year anniversary. (Feb2012) I am a nursing student at Loma Linda University and we had just finished finals week and he very casually asked me if we wanted to go to Disneyland that weekend to celebrate. Throughout the day we didn't really ride any rides. We walked and talked and just enjoyed the day, but around 3:30 in the afternoon he told me he wanted to "go to dinner" at 4. So we left the park and he led me to the rose gardens where they hold there weddings. There is a gazebo there and he walked me down the aisle up to the gazebo. As we go closer, I realized that my mom was there and so were our good friends Ron and Jamie. Mark set our stuff down and proceeded to get down on one knee and open the most perfect little box with the ring I have been wanting for quite a while. Mark has always had a hard time expressing himself; he's very conservative, but the words he said to me were absolutely perfect. Of course I started crying and instantly said YES and wrapped my arms around him. (My dad tried so hard to be there, but couldn't because he had to work.) Jamie was able to catch our special moment on video and get great pictures of Mark proposing. I love being able to look back on those memories and have them for the rest of our lives together. We then went to dinner together with my mom and our friends and celebrated together. 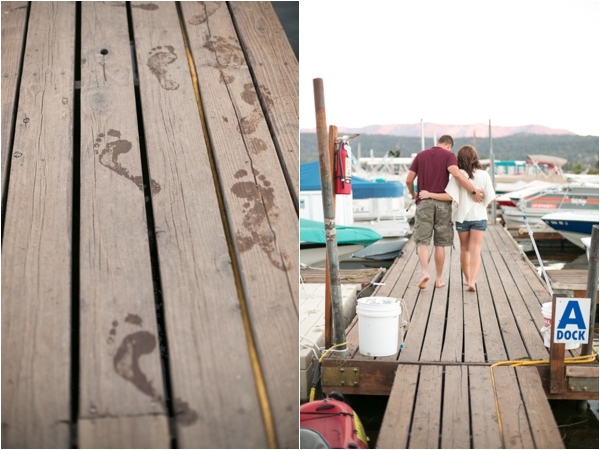 About their engagement session: Our engagement session was SO much fun! Kristen is amazing! I was nervous that we may have felt a little embarrassed for the shoot, but Kristen made us feel so comfortable in front of the camera. We did two looks. 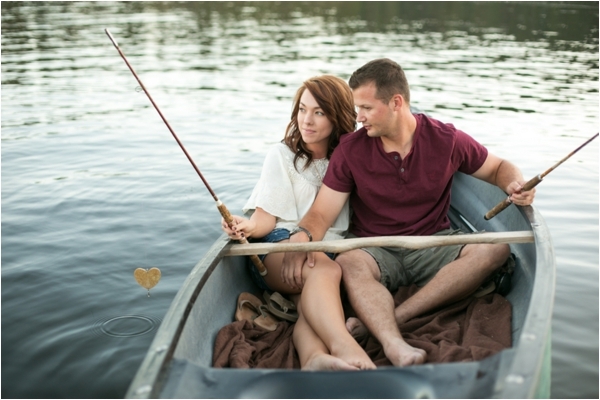 Mark and I have always loved fishing together and Kristen had the perfect idea of taking pictures on the lake, in a boat, with fishing poles! 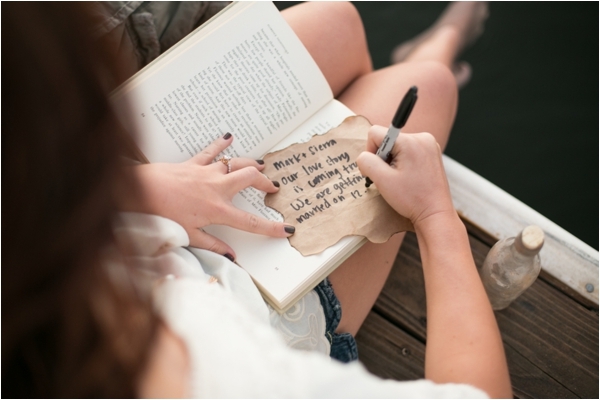 I instantly loved the idea. 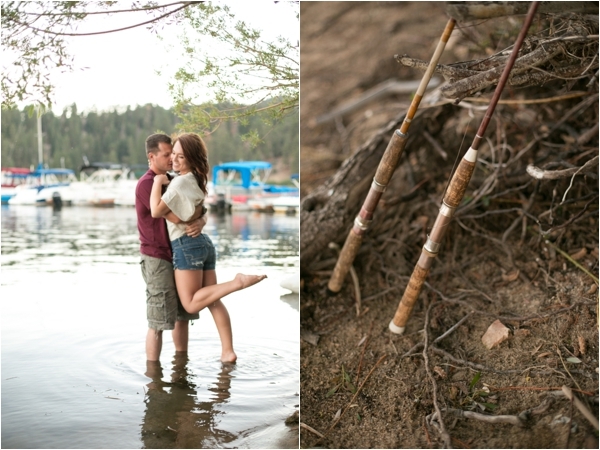 It was so fun being able to do something different and actually be out on the lake taking photos! Our second look was a fairytale forest look. It was so fun trying to act magical, but I love the way our photos came out. They were exactly what I imagined. When we found Kristen I wanted her to be our wedding photographer because I love the romantic, soft, fairytale look she goes for. She makes you feel amazing, like a princess really. She adds the extra sparkle that every girl wants and captures true love perfectly on camera!